This is a summer kigo for central Queensland nr Toowoomba. 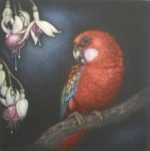 A cockatoo is any of the 21 species belonging to the bird family Cacatuidae. Along with the Psittacidae (the true parrots) and the Strigopidae (the large New Zealand parrots), they make up the parrot order Psittaciformes. kaka(k)tua (either from kaka "parrot" + tuwah, or "older sister" from kakak "sister" + tua "old"). are small to medium-sized arboreal parrots characterized by their specialized brush-tipped tongues for feeding on nectar of various blossoms and soft fruits, preferably berries. The species form a monophyletic group within the parrot family Psittacidae. Traditionally, they were considered a separate subfamily (Loriinae) from the other subfamily (Psittacinae) based on the specialized characteristics, but recent molecular and morphological studies show that the group is positioned in the middle of various other groups. 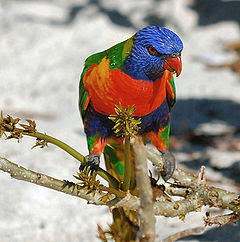 They are widely distributed throughout the Australasian region, including south-eastern Asia, Polynesia, Papua New Guinea, Timor Leste and Australia, and the majority have very brightly coloured plumage. Smoke rises from the cluster of huts towards the fiery clouds. A bent and buck-toothed woman energetically sweeps in front of her hut, and the dust mingles with the smoke. A bare-bottomed toddler is engaged with a scruffy pup in a tug-of-war over a stick. Abruptly he lets go, plunks himself down in the dirt and begins to cry. The woman shakes her broom at the pup and rushes to pick up the child. sometimes, just sometimes, it chrystallises out of monsoon clouds perched on a gulmohar tree, or just from a smell towing a memory. To escape from this cage. To escape from the cage! 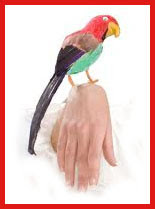 The parrot listened and said, "All right! I understand." The bird stuck out his legs, closed his eyes, and waited.